A spacious five bedroom detached family home set back from the road and overlooking a lovely open green, the property is very well presented and benefits from a landscaped rear garden. 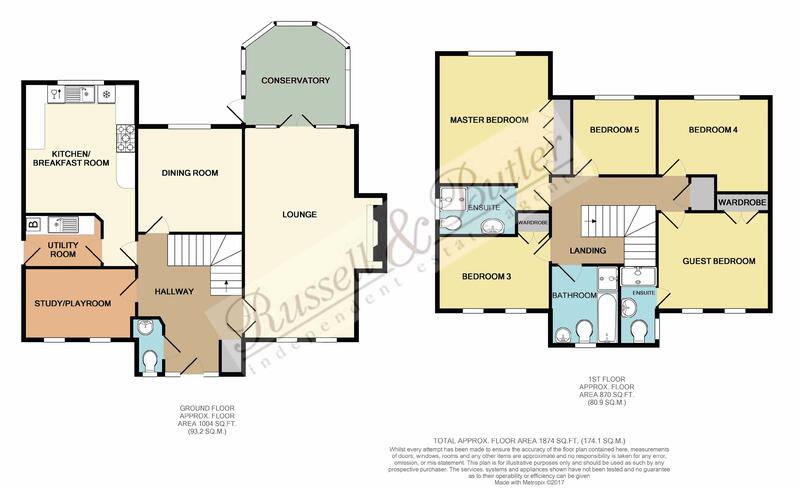 The accommodation comprises: Reception hallway, sitting room with feature recessed fireplace and French doors leading onto the conservatory, dining room, playroom/study, kitchen/ breakfast room, separate utility room. On the first floor: spacious landing, master bedroom with built in wardrobes and en-suite shower room, guest bedroom overlooking the green with built in wardrobes, also with en-suite shower room, three further bedrooms and family bathroom with separate shower cubicle. To the front of the property, driveway enclosed by railings, providing off road parking and leading to the detached double width garage, and enclosed gardens to the rear. EPC Rating C.
Providing access to accommodation, stairs rising to first floor, cloaks/storage cupboard, engineered wood flooring, part glazed double doors leading to sitting room. White suite of low level W/C, pedestal wash hand basin, radiator, Upvc double glazed window to front aspect. Brick base and Upvc conservatory with ceramic tiled flooring, door to patio and landscaped rear garden. Upvc double glazed window to rear aspect, coving to ceiling, radiator. Two Upvc double glazed windows to front aspect, telephone point, television point, coving to ceiling, radiator. Fitted to comprise inset one and a quarter inset single drainer sink unit with mono bloc mixer taps, cupboard under, a further range of base and eye level units with worktops over, ceramic tiling to splash areas, integrated dishwasher, integrated under counter fridge, ceramic tiled floor, radiator, Upvc double glazed window over looking the rear garden. Comprising inset sink unit with work tops, cupboard under, wall units, space for both washing machine and tumble dryer, gas fired boiler serving both domestic hot water and radiator central heating, ceramic tiled floor, radiator, extractor fan, door to side aspect. Loft access, part boarded with ladder, light and power, airing cupboard housing hot water tank, coving to ceiling, radiator. Fitted to comprise fully tiled shower cubicle with shower as fitted, low level W/C, pedestal wash hand basin, complimentary ceramic tiling to walls, heated towel rail, extractor fan, Upvc double glazed window to side aspect. Fully tiled shower cubicle with shower as fitted, pedestal wash hand basin, low flush W/C, radiator, ceramic tiling to splash areas, extractor fan, Upvc double glazed window to side aspect. With built in wardrobe, radiator, Upvc double glazed window to front aspect. Upvc double glazed window to rear aspect, radiator, telephone point, super fast broadband point. White suite of panel bath, separate shower cubicle with shower as fitted, low level W/C, pedestal wash hand basin, ceramic tiling to splash areas, heated towel rail, extractor fan,Upvc double glazed window to front aspect. Driveway leading to property entrance and detached double width garage, gated pedestrian access to rear garden, outside motion sensor lighting, part enclosed by wrought iron railings. Light and power connected, twin up and over doors, eaves storage space, personal door to side aspect. Attractive landscaped rear gardens, laid mainly to lawn, paved patio area, large corner decked entertaining area with inset lighting, box hedging with obelisk water feature, outside power supply, outside lighting, outside water tap. Fully enclosed by panel fencing.